A n O l d - S c h o o l L i g h t- S p or t A ir c r a f t airplane that didn't get lighter, because all of the numbers said I could go down one size in almost everything. Then I did things like making the bottom half of the door stressed skin aluminum and eliminated the tubing framework. The entire door half weighs less than 3 pounds. I also eliminated the flaps, which got rid of all of the support structure and the actuating mechanism. Everything helps." 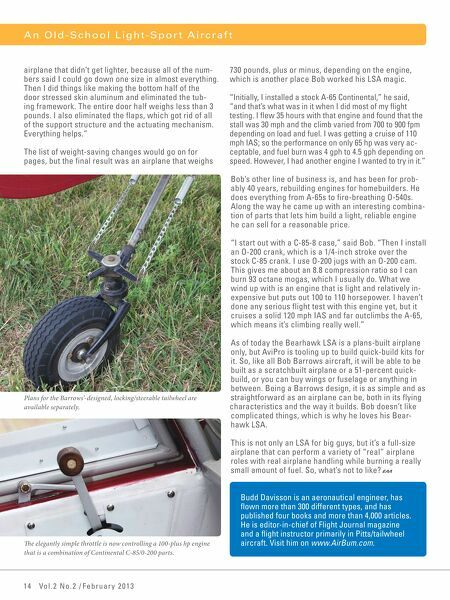 The list of weight-saving changes would go on for pages, but the final result was an airplane that weighs 730 pounds, plus or minus, depending on the engine, which is another place Bob worked his LSA magic. "Initially, I installed a stock A-65 Continental," he said, "and that's what was in it when I did most of my ﬂight testing. I ﬂew 35 hours with that engine and found that the stall was 30 mph and the climb varied from 700 to 900 fpm depending on load and fuel. I was getting a cruise of 110 mph IAS; so the performance on only 65 hp was very acceptable, and fuel burn was 4 gph to 4.5 gph depending on speed. However, I had another engine I wanted to try in it." Bob's other line of business is, and has been for probably 40 years, rebuilding engines for homebuilders. He does everything from A-65s to fire-breathing O-540s. Along the way he came up with an interesting combination of parts that lets him build a light, reliable engine he can sell for a reasonable price. "I start out with a C-85-8 case," said Bob. "Then I install an O-200 crank, which is a 1/4-inch stroke over the stock C-85 crank. I use O-200 jugs with an O-200 cam. This gives me about an 8.8 compression ratio so I can burn 93 octane mogas, which I usually do. What we wind up with is an engine that is light and relatively inexpensive but puts out 100 to 110 horsepower. I haven't done any serious flight test with this engine yet, but it cruises a solid 120 mph IAS and far outclimbs the A-65, which means it's climbing really well." Plans for the Barrows'-designed, locking/steerable tailwheel are available separately. As of today the Bearhawk LSA is a plans-built airplane only, but AviPro is tooling up to build quick-build kits for it. So, like all Bob Barrows aircraft, it will be able to be built as a scratchbuilt airplane or a 51-percent quickbuild, or you can buy wings or fuselage or anything in between. Being a Barrows design, it is as simple and as straightforward as an airplane can be, both in its flying characteristics and the way it builds. Bob doesn't like complicated things, which is why he loves his Bearhawk LSA. This is not only an LSA for big guys, but it's a full-size airplane that can perform a variety of "real" airplane roles with real airplane handling while burning a really small amount of fuel. So, what's not to like? Te elegantly simple throttle is now controlling a 100-plus hp engine that is a combination of Continental C-85/0-200 parts. 14 Vol.2 No.2 / February 2 013 Budd Davisson is an aeronautical engineer, has ﬂown more than 300 different types, and has published four books and more than 4,000 articles. 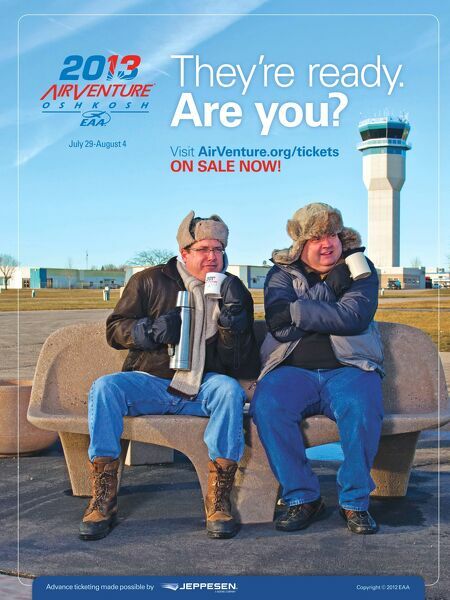 He is editor-in-chief of Flight Journal magazine and a ﬂight instructor primarily in Pitts/tailwheel aircraft. Visit him on www.AirBum.com.